One of the most expensive seasons is approaching. December, with its holidays, family parties, countless feasts and gift-giving, certainly racks up the receipts. The average person spends an extra several hundred dollars during the holiday season. Most people don’t have that much extra cash, so Cash4Books is here to help. The end of the semester is the perfect time to sell used textbooks. Use our new bonus code, doublecash, to get an extra 10% cash added to your total at checkout. Additionally, when you enter our Double Cash Sweepstakes, you could be the lucky winner of 100% extra cash! Step #1: Enter your book ISBNs on the Cash4Books Homepage or on our app for Apple and Android devices. We’ll quote you the price for your books. Step #2: Use bonus code: doublecash during checkout to get 10% free bonus cash added to your total. Step #3: Print your shipping label and mail us your books for FREE! When we get your books, you get your money, AND are automatically entered to double your money! 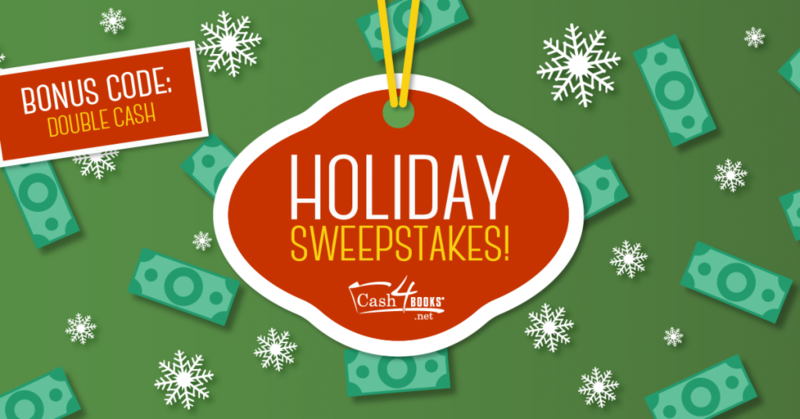 We will notify the lucky Double Cash winner via email in mid-December. Get prepared for the holiday season, and decide what to spend your newly acquired cash on! Maybe a present for Mom, or a plane ticket home for Christmas? This entry was posted in Cash4Books News & Updates and tagged bonus code, Cash4Books News & Updates, giveaway, make money, Save money on November 16, 2015 by Jim McKenzie Smith.